View More In Balance Bikes. The Sparkles bicycle from Kent is the perfect fit for the hip young lady learning to ride her first two-wheeler. 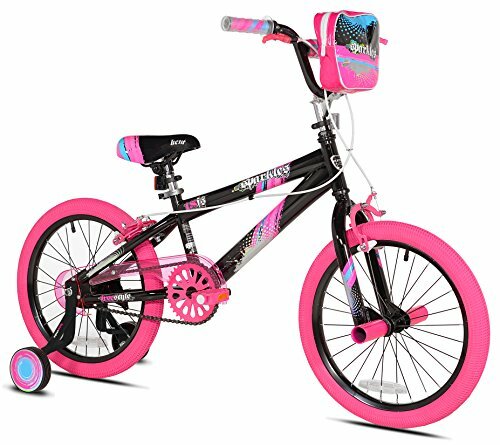 The oversized steel frame is painted a cool black with colorful graphics and sweet pink tires. Color-matched training wheels help her gain confidence till that special day. Adjustable high-rise BMX-style handlebars and the secure four-bolt stem moves as she grows and seat height is adjusted easily with no tools required via the lever-activated quick-release. Rear foot brake plus dual front and rear sidepull handbrakes keeps speed under control for the new rider. Low-profile tread street tires and padded seat smooth out the ride. Front axle pegs and a matching handlebar-mounted carry bag round out the package that will make her the envy of the neighborhood. If you have any questions about this product by Kent 18" Sparkles, contact us by completing and submitting the form below. If you are looking for a specif part number, please include it with your message.